Real-Time Data Analytics to Improve Your National Scores and CAHPS Performance. Qualitick is the industry leader in real-time performance measurement and analytics for rapid-cycle quality improvement. 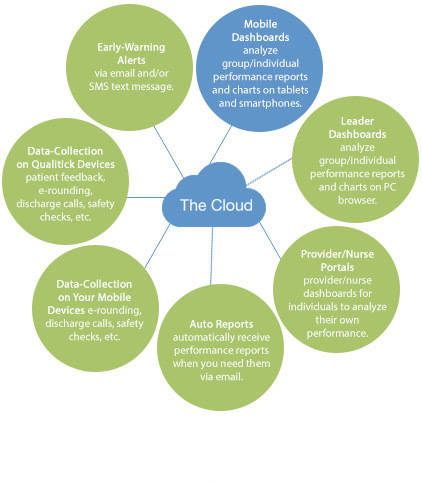 Qualitick helps improve CAHPS scores with cutting-edge solutions for patient experience, electronic rounding, patient call-backs, and employee engagement. For decades, the healthcare industry has depended on, and been conditioned to, traditional post-visit patient surveying. Modes such as mail, phone, email, and, more recently, SMS text messages, have been employed to establish levels of patient care received. These methods were mostly employed for two main reasons: (a) there were no other viable modes, and (b) the industry became conditioned and comfortable in using them. Low Response Rates and Poor Data Accuracy. The ramifications of using these traditional methods are significant. They yield very low response rates, which impacts data accuracy, and which, in turn, impacts the ability to affect improvements. This major obstacle is compounded by the fact that it can then take weeks, and sometimes months, to receive collected data. Therefore, healthcare leaders are waiting a long time to receive very little data, effectively setting them up to fail before they begin. With the advent of the CAHPS era, medical leaders have been challenged in not only attaining high patient satisfaction scores through better outcomes, but also sustaining them month-after-month. Additionally, CAHPS has essentially created a “national beauty contest,” where each medical facility is pitted against the others to avoid financial penalties and attain high star ratings, while also publishing hospital performance scores for public consumption and scrutiny. CMS mandates the use of mail/phone surveys for CAHPS, but has made it clear that CAHPS data is for hospital level comparisons, and not for comparing wards, floors, or staff members. However, CMS does NOT preclude (as many commonly believe) hospitals from pre-surveying patients, as long as they follow CMS guidelines. This has resulted in medical leaders looking for new ways to survey patients in conjunction with the mandated methods, which helps them overcome the low response rates, low data accuracy, and delayed reporting delivery issues. Real-time point-of-care surveying has demonstrated that it’s the only viable, sustainable, and cost-effective method. Whether you are e-rounding, obtaining patient feedback, discharge phone calls, patient safety checks, staff surveys and reviews, you can quickly collect your data via Qualitick tablets, which we provide, on our custom Apps for your iOS or Android tablets and phones. The Qualitick program automatically sends real-time early warning alerts via e-mail and/or SMS text message. Our sophisticated distribution system gives you the flexibility to setup your alert preferences exactly how you need it, so the right people, get the right alerts, at the right time. Too busy to get onto the reporting dash boards? No worries. The Qualitick program automatically emails your preferred reports, at whatever frequency you desire. Analyze group/individual performance reports and charts on PC browser. Automatically receive performance reports when you need them via email. Patient feedback, e-rounding, discharge calls, safety checks, etc. Via email and/or SMS text message. Leaders can review performance reports for all collected data on our state-of-the art dashboards through your PC browser. Our interactive dash boards provide critical data-analysis and insight for group and individual performance across all of your e-rounds and surveys. Also, coming soon, is access to reporting dash boards via our Apps for your iOS and Android tablets/phones. In addition to leadership dashboards, we offer individual performance portals for nurses and providers to access their personal performance reports. Studies have shown that when individuals are provided personal performance data, they often take responsibility for their own performance improvement. And if a core group of your nurses/providers improve their own performance scores, group scores can also elevate. To improve and attain superior HCAHPS scores requires a scientific approach, a method which can be replicated to produce desired results. 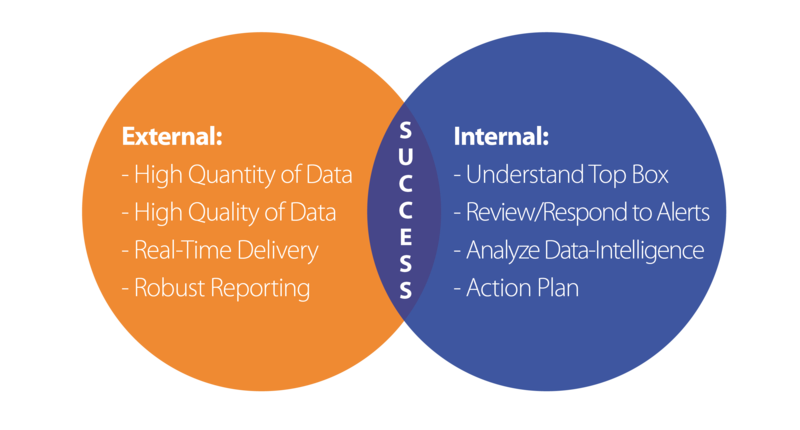 The scientific approach is illustrated by the following simple model incorporating the Internal/External analysis. Has to provide high quantity and quality of data. The data must be timely (i.e., real-time) and the reporting of data-intelligence has to be robust such that it fosters superior understanding of processes and execution by staff. This is the primary reason why many hospitals cannot elevate their HCAHPS scores. Hospitals often rely only on the CMS mandated mail/phone surveys, which do not provide any of these necessary attributes. Therefore, CMS implores hospitals not to depend on their mandated method of data collection. Having all the necessary data in your possession is not enough; it has to be understood and then correctly applied. It’s critical that medical providers understand the mechanics of HCAHPS scoring (i.e., Top Box), as its improvement in this score which elevates national standing. Medical leaders should be responsive to survey alerts, thoroughly analyze data-intelligence, and then apply this improved understanding by formulating strategies and tactics in order to improve process and execution. - Cobleskill Regional Hospital, NY. This case study outlines how Cobleskill Regional Hospital ED successfully employed the Qualitick program to dramatically, and consistently, improve their Press-Ganey scores and national ranking. With the never-ending list of challenges facing emergency departments today, increasing patient satisfaction is more challenging than ever before. But because EDs are the front door to the hospital for many patients, high patient satisfaction is critical to a hospital’s reputation and success. Copyright © 2007- 2018 Qualitick. All rights reserved.